If you are looking into flooring options for your home, oak is a practical choice. It is affordable, durable and easy to stain. Once you start looking seriously into oak flooring for your home, you will discover that both red oak and white oak flooring are available. Which will you choose? Well, the choice is up to you, but here are some of the differences between the two that may make it a bit easier for you to decide. Many would think that white oak is lighter in color than red oak. However, the white oak tends to be a bit browner and darker with more yellow tones. Red oak, on the other hand, has a pinkish tint and appears a bit lighter than the white oak. The difference in color tends to decrease when they are stained. When comparing graining in the two woods, red tends to have a stronger graining while white oak has a smoother look. Some people prefer the graining in the red because it tends to be more effective at hiding dents and scratches. Others like the smooth, sleek look of the white. Note: As compared to red, white oak has more mineral streaks that give it a contemporary look. The rays are also a bit longer on the white. White oak flooring is a bit harder than its red counterpart. On the Janka Hardness Scale, it rates 1360 as opposed to red oak’s 1290. However, because red oak’s grainy texture allows it to show fewer dents and scratches, it kind of makes it all even out! 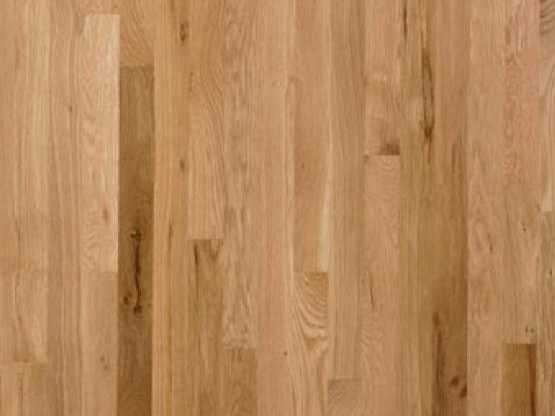 Because white oak is a closed grain wood, it is more water resistant than red oak. This also makes it more resistant to decay and rot. That’s why it is often used in boat building and is a great material for door jambs and other areas that are exposed to water and natural elements. If there is wood flooring in other areas of your house, you will want to keep it consistent throughout. Wood that is featured on stair treads, saddles, banisters and other transitions are likely to be red oak. Be sure to keep this in mind when buying additional hard wood flooring. When shopping for oak flooring, you will find that both red and white varieties are comparably priced. The price of wood flooring varies all the time and you may find that one week, red oak is more expensive than white and the next week, it will be the complete opposite. Whatever the price difference may be, it is usually minimal in any case. Oak flooring is a great choice for any home. The decision to choose red or white oak is one best left up to personal taste as there are pros and cons that come with both materials. Good luck finding one that works best in your home.